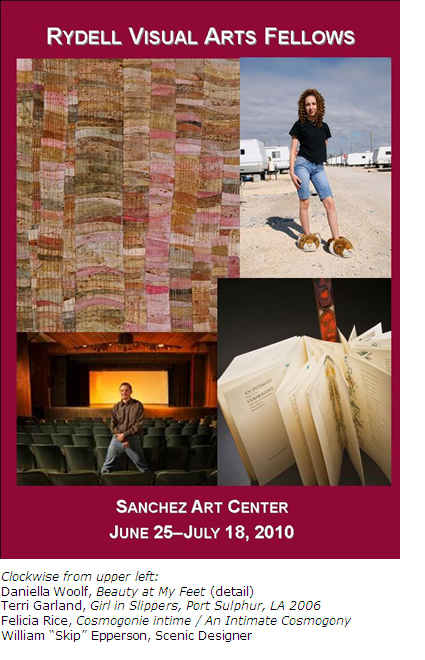 The Sanchez Art Center is pleased to host an exhibition by the 2008 and 2009 Rydell Fellowship award winners, opening Friday, June 25, from 7 to 9 p.m., and extending through Sunday, July 18. Exhibition curator Susan Hillhouse, Curator of Exhibitions and Collections, Museum of Art & History @ the McPherson Center, Santa Cruz, will give a talk on closing day, July 18, at 4 p.m. The Rydell Visual Arts Fund, created by Roy and Frances Rydell to promote Santa Cruz County artists and arts organizations, is administered by the Community Foundation of Santa Cruz County. Eligible artists are nominated by regional visual arts organizations and final selection is made based on artistic merit by a panel of arts professionals from outside the Santa Cruz area. 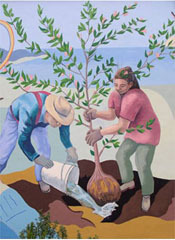 The 2008 and 2009 recipients recently exhibited together at the Museum of Art & History in Santa Cruz, and Sanchez Art Center is fortunate to be able to host their second exhibition. Terri Garland has photographed in the South since 1989, investigating and pursuing with curiosity the social landscape of the region, from the Ku Klux Klan to the aftermath of Hurricane Katrina. Her photographs delve deep into American history and the American psyche. Some of her photographs, such those of the Ku Klux Klan, are indeed disturbing. Garland explains, “The dualities of life and death, desire and constraint, the secular and the sacred are but some of the ideas which draw me to the South. During my travels, I have often observed and shown darkness. In continuing this work, what I am beginning to discover is some small fragment of salvation beyond the margins of the obvious.” Among her awards are a National Endowment for the Arts fellowship and an Arts Silicon Valley photography fellowship. Felicia Rice’s work involves the fascinating intersection of words and images. In 1977 she founded Moving Parts Press, and began her career as a printer, teacher, literary/fine arts publisher, and book artist. In her own words, she collaborates “with visual artists, performing artists and writers to create book structures in which typography and the visual arts meet and merge.” Moving Parts Press has been included in exhibitions and collections both nationally and internationally, from book shows in New York and Frankfurt to the Victoria & Albert Museum, and has also received numerous awards and grants from organizations that include the National Endowment for the Arts and the French Ministry of Culture. Daniella Woolf has worked in a variety of media, including jewelry and metalsmithing, fiber and textile structures, collage, installation and most recently encaustic. She brings a “textile sensibility” to the ancient medium of encaustic, a painting technique that involves mixing beeswax with damar resin and suspending pigment in the wax medium. “In merging these two disciplines along with my limited choice of materials, I create a newly formed language,” says Woolf. Her work has been exhibited at the Cleveland Museum of Art, Pittsburg Center for the Arts, and internationally at the British Craft Centre, London and Musée cantonal des Beaux-Arts de Lausanne. She teaches popular encaustic workshops and writes the blog Encausticopolis about all things wax.